In 2013 the Vitra Design Museum ran the exhibition ‘Learning from the Vernacular’, exploring traditional architecture as a source for inspiration for sustainable methods of construction for contemporary architecture. Particular focus was given to examples from South Africa, Egypt, China, Malaysia and Cameroon. 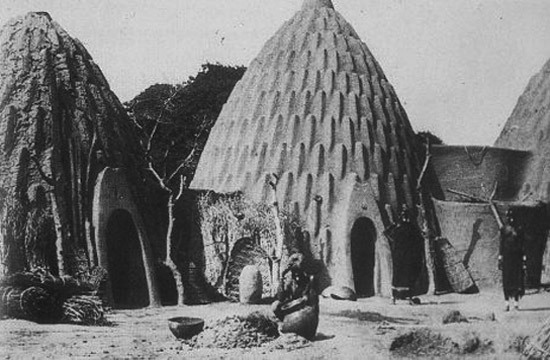 Here, Musgum clay houses in Cameroon were featured as examples of clay construction, one of the earliest natural building material and a good alternative to cement as it does not contribute to CO2 emissions in the atmosphere. 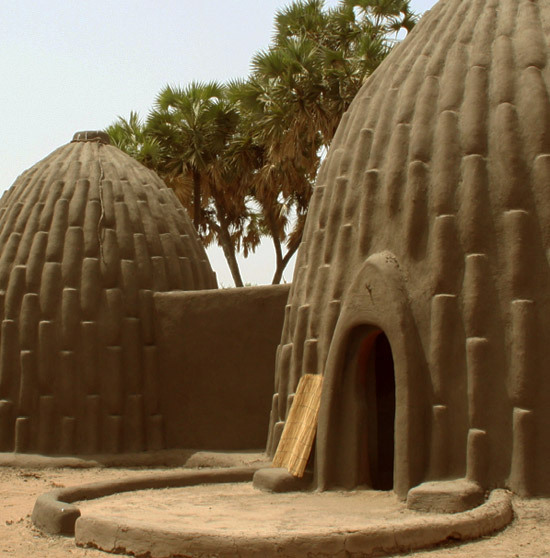 The Musgum, an ethnic group in northern Cameroon, created their homes from compressed sun-dried mud. 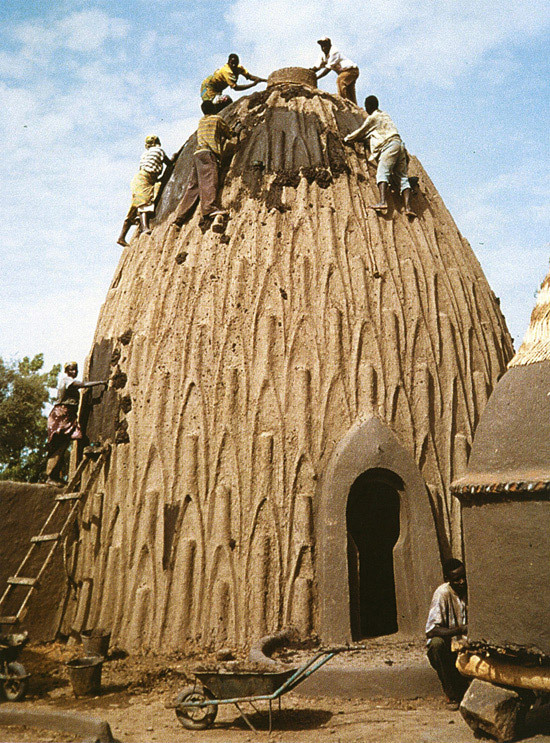 Mud is laid over thatch reeds and the smooth curves shaped by hand. Due to the extreme climate and limited resources, every detail has a function. 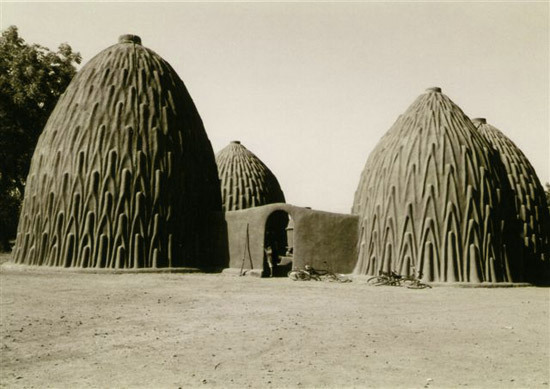 The dwellings (also known as ‘cases obos’) are built in the shape of an inverted-“V’ or conical form. 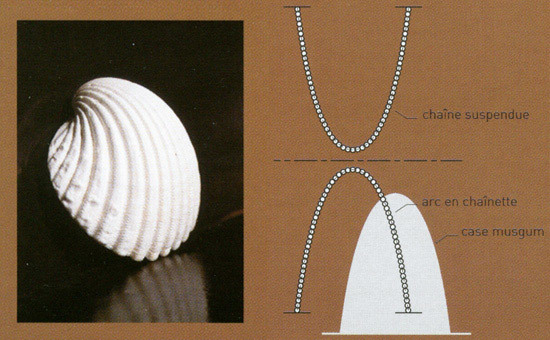 In the book “Earth Architecture”, Ronald Rael observes that the Musgum houses are in the form of “a catenary arch—the ideal mathematical form,” which can withstand the load of the building with minimum use of material. The domes are slim and work on the principle of compression providing rigidity to the structure without any twisting or bending moments. The walls are thicker at the base than at the summit to aid stability. 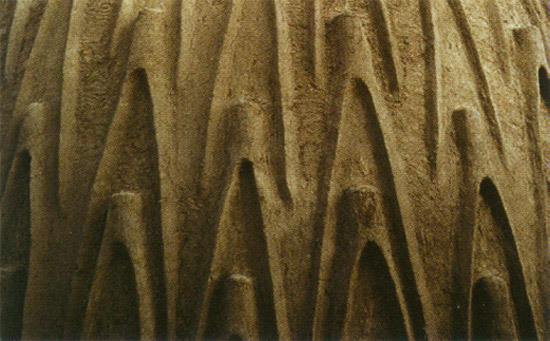 The mud is applied spirally in lifts of approximately half a metre, allowing each lift to dry before adding the next. The geometric patterns on the exterior face of the domes serve as steps for workers who stand on them during construction and also during subsequent maintenance. These also aid rainwater to run off the surface. The structures can reach approximately 9 meters, keeping the interior cool under the african heat. A small opening at the top helps with air circulation and can be used as an escape hatch in case of flooding. This circular opening, a few centimetres in diameter, also known as a “smoke hole”, is closed with a slab or a pot during the rains to prevent water entering the house. The dwellings have a single door resembling a keyhole; narrow up to knee level, widening at shoulder level. The characteristic settlement form is the compound, a cluster of dwellings and granaries arranged around a central courtyard and linked by compound walls. Today, these buildings have become somewhat obsolete, with only a few groups still keeping up the tradition. Images: Craterre-Ensag (the French center for research and application of earth architecture, part of the school of architecture of grenoble), via Designboom.